No matter what it’s called, folks have sipped this hot, spiced drink for centuries in Europe during the holidays and wintertime months. Today, the spices used in mulled wine are finding a new home in apple cider and fruit juices, making this a treat for the whole family. Whether you’re decorating your Christmas tree or simply sitting in front of your fire on a cold evening, grab a mug and enjoy. This stuff is so addicting ....it tastes like liquid Christmas! Bisschopswijn is really a pleasure to all the senses. I love smelling to on the stove almost as much as I enjoy hearing it perk away in the coffee pot. Mostly, I just love drinking it up and sharing the comfort with good company any fall or winter evening. Yum! I loved it! It's quite an aromatic mixture that had my kitchen smelling like the holidays. It has a very distinct flavor and I could see it being a perfect after-dinner drink in the wintertime. Cheers! The Bisschopswijn was a delicious addition to our Christmas celebration, and we have enjoyed it several times since—both with and without Apricot Brandy. Your mulling spices are a big hit with my family back in New Hampshire, not to mention with my wife and I as well. Guard that recipie carefully! 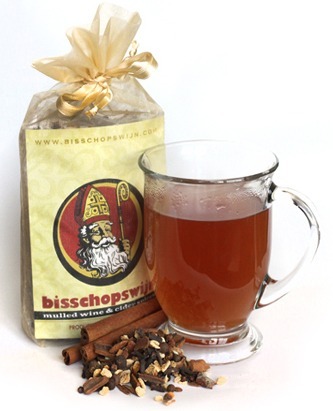 We served Bisschopswijn last year at our annual Sinterklaas Day Party, and it was a huge hit! Everyone was asking for more. We even gave the sachets to our relatives for Christmas. It's the perfect holiday gift. Everyone loves it!